Ceiling tiles or boards are used in inside development for enhancing the general style and acoustic protection. Ceiling tiles have assumed an essential part in molding the market for reasonable homes. Inferable from these reasons creating nations are ready to see a critical interest for ease ceiling tiles sooner rather than later. Ceiling tiles are broadly being utilized in workplaces, lodgings, transportation terminals, retail spaces, and hospitals as suspension, building borders, and as drywall network frameworks. Significant applications that are aiding towards the growth of the worldwide market are tourism, banking, healthcare, governance and commercial spaces. Other than this, ceiling tiles additionally improve the acoustics of encased spaces and can even go about as heat insulators. Due to these additional features served by these tiles, the product demand is expected to follow an upward trend over the coming years. According to analysts at TMR, the global market for ceilings tiles is projected to rise at a CAGR of 10.10% over the period between 2016 and 2024. Furthermore, the market was valued at US$21.6 bn in 2015 and is expected to reach a value of US$51.3 bn by the end of 2024. Mineral wool incorporates strands got from slag, rocks, and glass wool. This segment incorporates wet felt and give mineral strands a role as well as fiberglass. These substances have critical noise reduction qualities and are being increasingly used in business spaces that are presented to boisterous environment. The demand for the product segment of mineral wool is assessed to increment considerably in the forthcoming years, inferable from their execution properties and recyclability. Metal based items represented the second-biggest industry share in past years. Steel, aluminum, and tin are the significant metals utilized in the production of metal ceiling tiles. Supportable and eco-friendly have additionally surfaced in the global market for ceiling tiles, and the organizations that fabricate these items are expected to get an upper hand over others. Ceiling tiles are expended in various sub-applications. These sub-applications principally incorporate corporate workplaces, healthcare centers, retail and supermarkets, and instructive foundations. Cafeterias, eateries, restrooms, open utility rooms, recreation centers, and airplane terminals are other industrial end-uses of ceiling frameworks. The demand for development of residential spaces is astoundingly high because of the enhancing GDPs, rising expendable earnings, changing way of life, interest for better quality, and better aesthetics. This could help boost the global ceiling tiles market in the forthcoming years. North America holds a dominant share in the global market, which is closely being followed by Europe. Asia Pacific is expected to be an emerging market during the forecast period. The emerging economies of Asia Pacific such as China and India are expected to augment the demand for ceiling tiles as the construction and building industry gains momentum. The report states that Europe held a significant share in the overall market in 2015 due to booming building and construction activities it the region. The manufacturers aim to achieve optimum business growth and strong market position through the implementation of various strategies such as acquisitions, joint ventures, production capacity expansions, new product launches, promotion of key product brands, and significant investments in the research & development. High degree of backward and forward integration of prominent ceiling tile firms persists in the global industry. This in turn, has intensified the competition thus making it difficult for entry of new players. Vendors operating in the global ceiling tiles market are USG Corporation, SAS International, Techno Ceiling Products, Armstrong World Industries, and Saint-Gobain S.A., among several others. Ceiling tiles, also known as ceiling panels, are sound absorbing and lightweight construction materials which are used to cover a ceiling area. These lightweight tiles are used in the interior of buildings, placed in an aluminum grid for the primary purpose of enhancing the acoustics of a room, besides providing thermal insulation. Different types of ceiling tiles are manufactured in the industry such as mineral wool ceiling tiles, metal ceiling tiles and gypsum ceiling tiles. Based on application ceiling tiles are employed in residential, non-residential and industrial application. The report estimates and forecasts the ceiling tiles market on the global, regional, and country levels. The study provides forecast between 2016 and 2024 based on volume (million square meters) and revenue (US$ Mn) with 2015 as the base year. The report comprises an exhaustive value chain analysis for each of the product segments. It provides a comprehensive view of the market. The study includes drivers and restraints for the ceiling tiles market along with their impact on demand during the forecast period. The study also provides key market indicators affecting the growth of the market. The report analyzes opportunities in the ceiling tiles market on the global and regional level. Furthermore, the report analyzes substitutes of ceiling tiles. It also provides the global average price trend analysis. The report includes Porter’s Five Forces Model to determine the degree of competition in the ceiling tiles market. The report comprises a qualitative write-up on market attractiveness analysis, wherein product, application and countries have been analyzed based on attractiveness for each region. Growth rate, market size, raw material availability, profit margin, impact strength, technology, competition, and other factors (such as environmental and legal) have been evaluated in order to derive the general attractiveness of the market. 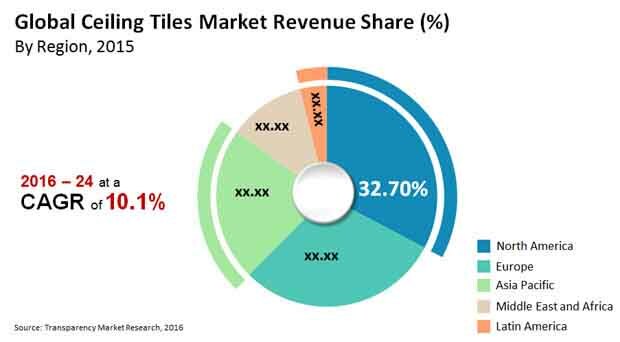 The study provides a comprehensive view of the ceiling tiles market by dividing it into product, application and geography. In terms of product, the ceiling tiles market has been segmented into mineral wool, metal, gypsum and others. In terms of application, the ceiling tiles market has been segmented into residential, non-residential and industrial. The non-residential segment has been further bifurcated into hospitality, commercial and institutional. Application segments have been analyzed based on historic, present, and future trends, and the market has been estimated in terms of volume (million square meters) and revenue (US$ Mn) between 2016 and 2024. Regional segmentation includes the current and forecast demand for ceiling tiles in North America, Europe, Asia Pacific, Latin America, and Middle East & Africa (MEA). Additionally, the report comprises country-level analysis in terms of volume and revenue for product and application segments. Key countries such as the U.S., Canada, Mexico, Germany, France, the U.K., Spain, Italy, India, China, South Africa, and Brazil have been included in the study. Market segmentation includes demand for individual product and application in all the regions and countries. The report covers detailed competitive outlook that includes market share and profiles of key players operating in the global market. Key players profiled in the report include Armstrong World Industries, Inc., New Ceiling Tiles, LLC, Saint-Gobain S.A., SAS International, USG Corporation, Knauf, Techno Ceiling Products, ROCKFON, MADA GYPSUM, and Odenwald Faserplattenwerk GmbH. Company profiles include attributes such as company overview, number of employees, brand overview, key competitors, business overview, business strategies, recent/key developments, acquisitions, and financial overview (wherever applicable).